PGR Events – Thesis Writing Sessions: Extra Sessions Added! 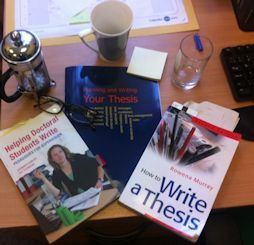 Thesis Writing 1 – Developing Structure looks at how to plan your thesis, how to arrange the text and how to organise and accumulate chunks of writing in order to help finish your thesis within the registration period. We will look at the most effective ways to become a good research writer both in terms of quality and production and in particular we will emphasise the need to practice writing. We will discuss how writers engage in many different approaches and processes when developing effective writing and we will describe ways in which you can learn your subject area discourse. The overall aim is to create productive and effective research writers. Thesis Writing 2 – Constructing Argument will discuss what argument is with regard to academic and thesis writing; why we need argument in a thesis; how to critique the argument of others and how to construct effective arguments for ourselves. There are some elements of critical thinking involved in the session but overall the aim is to enable participants to construct, identify, and analyse arguments for use within a research degree thesis. There are still place on the Careers Development Portfolio Networking event for Wednesday 19th of November.